The plot is a simple one. Major Smith leads a specially selected crack commando unit on a daring raid to rescue an American general that's being held prisoner at the Schloss Adler, a castle high up in the snowy Austrian mountains. Clint Eastwood stars alongside Burton as one of the commandos, where he specialises in blowing things up, shooting Nazis and not saying very much. However, after two of the commandos are murdered in quick succession, it soon becomes clear that there’s a traitor in the ranks. 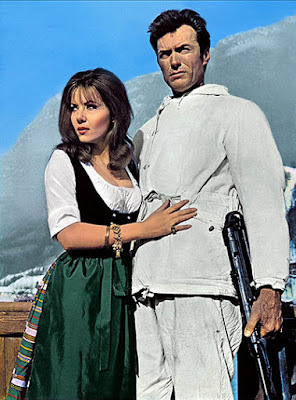 Where Eagles Dare really does have it all. Spectacular snowy scenery; the plummy tones of Burton sending the radio signal ‘Broadsword calling Danny Boy’; the cool and calm Clint; beautiful female spies including one masquerading as a buxom beer maiden; impersonating German officers; and lots and lots of explosions. Even now as a 30-something man, the idea of replicating the antics of Burton and Eastwood holds tremendous appeal. After all, parachuting into Austria, clandestine meetings with the alluring Mary Elison, riding a cable car and blowing things does hold a certain charm. 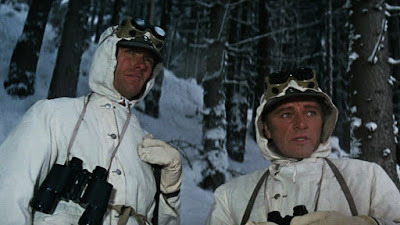 If you've never watched Where Eagles Dare before, I would urge you to give this war-time flick a go. After more than two hours of skullduggery, deception and intrigue, I always have a strong urge to wear an alpine parka, M43 field cap and walk about in arctic conditions. Naturally, I would soon get cold so would make my way to the nearest bierkeller to ask Ingrid Pitt if I can sing to her. Alas, this fantasy remains unfulfilled. Oh that's a classic from childhood, watching with my Dad! I would happily watch again if it's shown on telly. Brr! My husband loves that film! You can't beat a good classic adventure story.